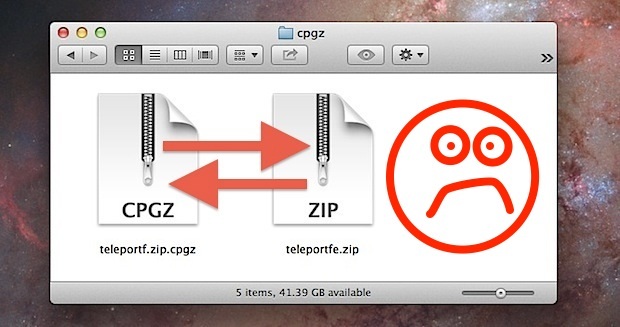 Ever had a zip file turn into a cpgz file? This is an infrequent problem, but here’s what happens; When the .zip file is attempted to be unzipped, it extracts into a .cpgz file, which then can also be launched in Archive Utility, only to then turn back into a .zip file, which then turns into a .zip.cpgz file, and basically the archive gets stuck in an infinite loop as it’s being decompressed into one variation of the other, over and over again. Annoying, right? 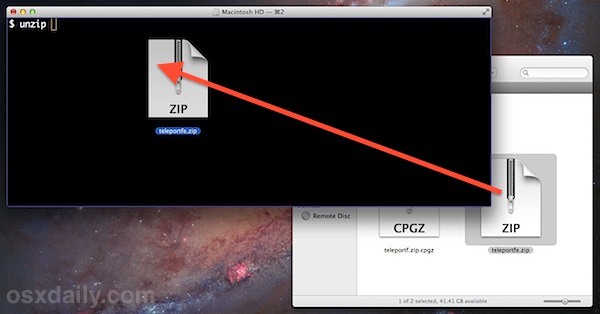 Not to worry, this tutorial will detail how to open a cpgz zip file on a Mac. Accordingly, dealing with the zip cpgz loop is usually best handled in a few different ways. Before beginning, you may want to check the md5 hash or SHA1 of the origin file if possible, that can easily tell you if the file was corrupted or is incomplete. Nonetheless, not all servers provide you with either, so we’ll cover three ways to handle this CPGZ zip issue without that, and crack open that error prone zip archive once and for all. If you downloaded the original file with Firefox, try downloading the zip file again with Chrome or Safari, and vice versa. Sometimes it’s just a matter of redownloading the file again before it unzips normally. This is great for smaller files, but large downloads don’t always make sense to do this with, and if you know for sure the file isn’t corrupted because of checking md5/sha1 sums or otherwise, you can attempt two other options. Downloading the original zip again often works to be able to open zip file properly on a Mac and Windows PC, without having to deal with the cpgz file. The command line method should work basically every time, as it will forcibly extract even partially downloaded files. If you know the file is only partially downloaded though (by way of checking md5 hash or otherwise), you really ought to just download the file again. The archives files should now be accessible as intended. On a quick side note, with Archive Utility having some crashing problems lately, there has never been a better time do grab an alternative like The Unarchiver. It’s free, handles archives of just about any conceivable format, and is highly recommended. This troubleshooting post comes in response to a question we recently got recently on Twitter (don’t forget to follow us there too), and, as luck would have it, I then encountered the same issue myself after downloading the mouse sharing app Teleport. For my purposes, I used the command line method, but Unarchiver was also confirmed to work just as well. It was high time someone talked about this problem. Well done. Thanks guys! I had a .zip file that was doing this to me, but The Unarchiver came to my rescue! This will also happen if someone mails you a link to a zip file in Dropbox, and you right-click on that link and ‘Save Link As’. Instead, click on the link, and download it from the Dropbox page that is displayed. Thanks folks, the command line thing did the trick…not sure why the dropbox download does that. Thanks!! Nothing worked for me except clicking on the link first, then download. I had this problem with a zip of mp3 files (Mac OS X and downloaded via Firefox). I went o the File menu, clicked on “Get Info” and then changed Open with: Archive Utility to Open with: Stuffit Expander. To my surprise it worked a treat. This seems to indicate that the files had downloaded OK, and the problem lies elsewhere. This worked quickly and easily. Thanks for the smart workaround. Thanks so much for this! Had a zip archive that was doing this but the Terminal work around solved it. You’re a life saver! did you try just changing the name to something with out spaces? I copied it via an external hard drive to my old 10.4.11 laptop, and that old system opened it up just fine! Copied the open folder back to the new laptop and everything installed perfectly. The inbuilt inflater ability of OSX does not recognise some of the modern formats of .zip packing, thereby causing this. The ‘unzip’ CLI tool may work sometimes, but otherwise one could also do a “brew install 7zip” and use “7za x ” to extract just about any format on the command line. The Unarchiver is a nice suggestion, thanks. I just downloaded a file like this. The name of the file had no extension. When I added “.zip” to the end of the name, it unpacked normally when double-clicked. May be the easiest thing to try first. new mac user here, jays us it worked! thank you! It Worked! – The CPGZ loop threw me off for some time. After reading your advice I tried the terminal method and worked perfectly. stuffit expander seems to work too..
FYI, in case others can’t find their uncompressed file/folder, mine showed up in the root of my user directory (alongside Applications, Documents, Pictures, etc). That is because your terminal defaults in that folder. You can always get to the directory you want using cd command and then do the terminal method. I have an ongoing problem with this and was hopeful after reading this thread. I have OS X 10.10.3 and have tried many unarchivers, including the one listed above. The Unarchiver preferences won’t even allow me to select .zip file types. Ran terminal which ran a while and did not unzip the the file. Very frustrating, keep getting the .cpgz files created and no content. THANK YOU!!! I was at a loss to know how to get out of the infinite loop. Downloading from another browser worked. Great tutorial! Great clearly written article. The unzip from command line option did the trick for me. Thank you! Very helpful! Thank you for the info! Yay, thank you so much for sharing! I’d never encountered this problem before. Unarchiver worked. Firefox was the culprit. Thanks for the great advice. Thanks for this! I’ve been having this problem with files supplied by a client. The Unarchiver (free download) was able to unarchive the original .zip file first time. Thanks! Thank you! The terminal command was a short and sweet solution. 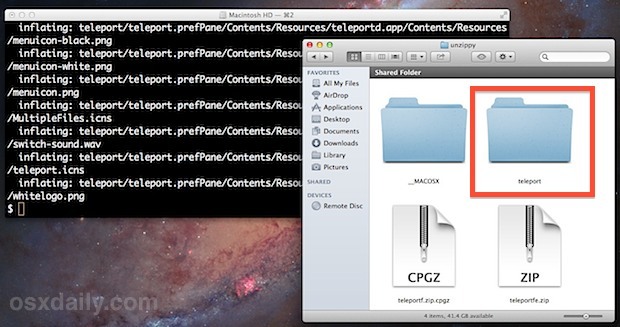 It happens reliably when I create a .zip on a windows server, copy the file down to my mac via RDC (mapped drive). It only happens with one particular server, otherwise I use this method routinely with other win servers with no problems. The file is not corrupt as far as i can tell, or incompletely copied, some sort of bug or mismatch created by this sequence of events is responsible. I tried the Terminal workaround. It did fill in the name of the file after I dragged to the terminal window, but when I hit return, nothing seemed to happen. Where should the unzipped file be? It did not appear on the desktop or in the Terminal window. Should I look somewhere else? OK. It didn’t work. Any suggestions? where *your terminal is* operating. ditto -k -x worked for me. I was investigating this same issue and found that the Windows Server 2012 box that was generating the zip file was using version 4.5 of PK tools (remember pkzip/pkunzip?) whereas El Capitan only supports zip archives up to version 2.1. Unarchiver was the answer here since it incorporated newer tools. Thanks! Terminal did the job for me. Thanks. unzipping from command line worked for me. Thanks for the tip! It helped me to export several sliders using LayerSlider for WordPress. Terminal says there was “1 extra byte at beginning or within zipfile”. But it unziped it anyways, once that was done I was able to create a zip easily! This is a great tip but I have an older Macbook and the newest version of the Unarchiver does not work. Is there any way to download an earlier version that will work on my Mac OS X Version 10.6.8? It also stated it could not find a zipfile directory in this particular file. The Unarchiver did not unzip the cpgz file, but actually created yet another .zip file, and simply continued the cycle. Also, it does not appear in my applications folder, and I cannot locate it to delete it. Now it is set to unzip all my files – but will not unzip any files with the .zip extension! I get an error message that The Unarchiver cannot open this type of file. Any suggestions about how I can delete this app when it does not appear in my applications folder? Thank you. Thanks for this tip! Unzipping via the terminal did the trick for me. In my case, I changed the file extension from .mysql.gz to sql and the file is fine, I guess it was never an archive in the first place. This should correctly untar (unzip) the original file.zip file. The unarchiver fix worked for me. tl;dr In my case the file extension was .zip and the file was actually a RAR archive. As a test I also used the unrar command “unrar x renamed.zip” which worked. If you use brew you can install “unrar” and/or “p7zip”. I would recommend that if you do use the command line, to use 7-zip as it’s output is helpful when diagnosing issues with archives. Surprisingly, even the terminal command approach failed, despite an “inflating” message which made it appear it may have worked. Indepently, I also tried a third party (like Derek Scott suggested above way back in 2013, but prior to reading his comment). In my case I tried Winzip for Mac free trial, and it worked beautifully! Nothing is as simple as advertised, in the world of electronics: hardware and software. This article saved my life. Thank you! Happy to hear this worked to fix your issues opening a zip / CPGZ file! You’re welcome! Thank you! I’ve been trying to figure out this problem without success until I found this article. The Unarchiver didn’t work. Then I realised the file I was trying to extract had zero bytes. So I found another copy I had downloaded in the earlier step, which was over a gb. The Unarchiver was able to extract it where my mac simply couldn’t on its own. Thanks! Thank you for sharing this!! I was finally able to get my file open.